If laughter is the best medicine, then Marti MacGibbon has not only healed herself, but has healed others. Through traumas including drug abuse, eating disorders, and sexual exploitation, and into her recovery, MacGibbon has learned that the ability to laugh at herself and to make others laugh can be a lifeline. In her new memoir, Fierce, Funny, and Female, MacGibbon “celebrates her resilience and her willingness to keep laughing,” according to Foreword Reviews’ Claire Foster. In the interview below, MacGibbon tells how she achieved this. You’d think that the trauma you’ve been through in your life would have muted your sense of humor. Instead, it seems to have enhanced it. How did you achieve that? Throughout my life, my sense of humor has served me well: as a means of communication, a coping mechanism, and a way of affirming and preserving my sense of self. I gravitate toward funny people, so that helps. When your friends make you laugh, or you make them laugh, it’s a celebration of life. I embrace humor that is never mean-spirited. My husband, Chris Fitzhugh, is one of the funniest people I’ve ever known; we’ve laughed together each and every day for decades. I’ve lived through some very traumatic things. The addiction and trauma developed and escalated along the way; trauma, shame and fear fuel addiction. Then I discovered that life is brimming with second chances, and I took a chance—on healing and resilience. Since my first day in recovery, I’ve celebrated humor and laughter, gratitude, love, and courage. Life is challenging, sometimes terrifying, but beauty, hope, and strength can be found every step of the way. When I reflect on the most difficult parts of my life today, that’s what I see. Look back, learn, and whenever possible, laugh—that’s my motto. Stand-up comedy taught me powerful lessons about life, and how to meet challenges and overcome them. I describe some of those lessons, and stories about how I learned them, in both Fierce, Funny, and Female and Never Give in to Fear. When you sit down to write a memoir, what comes first: the anecdotes, the stories … or an overall vision of what you want to say? As both author and keynote speaker, the stories come first, and I use stories to carry the message. The way I see it, our lives are made up of stories: things we experienced and remember today, and the stories we tell ourselves that influence our concept of self, and outlook on life. If you tell yourself good stories with positive outcome, your attitude tends to be more optimistic as you confront obstacles and difficulties. And you have the power to look back on past painful experiences, along with real or perceived failures—and see the courage and strength in your actions, the grace in situations, the lessons learned. When you recognize that you are sum of all your experiences, and make a conscious decision to love and accept yourself, you reach a place of empowerment in knowing that you are stronger, braver, funnier, smarter, not in spite of the things you’ve lived through, but because of them. In both Never Give in to Fear and Fierce, Funny, and Female, my voice as a writer proceeds from that place of empowerment. Trauma therapy, cognitive reframing, and mindfulness meditation helped me to get there, and I engage those tools to stay grounded and empowered today. When was your “rock bottom?” When, or how, did you make the decision to end the cycle of addiction? I spent years of my life at “rock bottom.” There was no single low point. But my recovery began with one powerful moment of clarity, a flame ignited by the recognition of hope and of unconditional love. I described that defining moment in Never Give in to Fear, and if I include it in this interview it may be a spoiler for those who have not yet read my books. I count one specific date as the turning point, because in that moment I found the strength to carry out a plan of action toward recovery. But many moments led toward that ultimate place of healing and empowerment. Speaking as an addiction specialist, I want to remind readers that addiction is a disease, it’s not a series of bad decisions, or a failure to make a decision to end the cycle; it is not a moral weakness. The idea that an addict must hit rock bottom in order to recover has been disproven many times over. Addiction specialists and interventionists work to “raise the bottom” so that individuals can recover earlier in the disease process and not have to go through what I went through. In Fierce, Funny, and Female, you are very honest and down-to-earth, and you describe experiences that are traumatic, hilarious, and even terrifying. You don’t try to pass yourself off as a victim or hero. Is it difficult to write in that style? I like to describe what happened and leave it up to reader to make conclusions if they are so inclined. When I started doing standup in the 1980s, Jay Leno told me, “Never underestimate your audience.” He gave me, along with other beginning comics, a lot of valuable advice. Some of those stories are included in Fierce, Funny, and Female. I took a page from Leno’s playbook when I wrote Never Give in to Fear, and again when I wroteFierce, Funny, and Female. I would not describe the process as difficult, but I would say it feels pretty scary sometimes. If I begin to listen to the fear, worrying about what people will think of me, fear of judgment, etc., then I remind myself I may be either underestimating my audience, or underestimating myself. And then the fear is replaced by courage and a desire to create something that offers depth, humor, inspiration, entertainment, satisfaction and more for the reader. I’ve been putting together an inspirational book that includes strategies for stress management, motivation, increasing creativity, and having fun. And I am beginning to work on a third memoir that uses stories and anecdotes all the beauty and power of healing I’ve experienced since I turned my life around. Within the past few weeks, it struck me that these two books may merge. Why not? It might be a fun read. The subject matter in itself is daunting, even frightening, but MacGibbon’s courage and comedy make Fierce, Funny, and Female a winner. Being funny is a survival skill. Marti MacGibbon’s incredible memoir Fierce, Funny, and Female is not only a survivor’s tale but an inspirational story of overcoming the unthinkable, again and again. Through drug abuse and eating disorders, through sexual trauma and the murky waters of sobriety, MacGibbon relates how she found a way to smile again. An inspirational speaker and mental health professional, she has clearly made peace with her personal story. 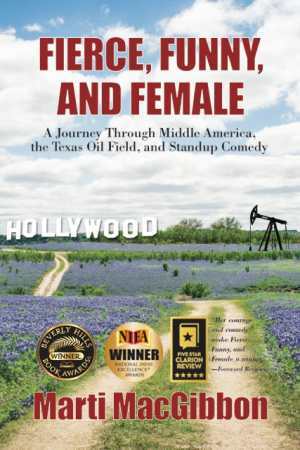 Fierce, Funny, and Female has an accessible, friendly tone that sometimes stands in sharp contrast to the extremely dark, tragic subject material. These memories have clearly been shared more than once, and the chapters read like well-worn territory. This is MacGibbon’s story, and she’s sticking to it. Rather than depict herself as a victim in every scene—which would be logical, considering what she’s been through—MacGibbon represents herself as a survivor. With the value of hindsight, sobriety, and a hell of a lot of therapy, her narrative self puts the pieces together to make sense of her wild and crazy life. “I realize now that I was attempting to control the trauma not only with drug seeking, but with anorexia, that this is fairly common behavior for a teen with post-traumatic stress, but then I only knew I was running, as fast as I could, to keep ahead of some unknown, inexorable destruction,” MacGibbon writes. The point isn’t to portray herself as a hero or even to score sympathy points: it’s to show that recovery is possible, no matter what your circumstances are. Although being kidnapped, or forcibly injected with psychiatric drugs, aren’t everyday experiences, MacGibbon is very relatable and, yes, even funny while discussing such incidents. Her sense of humor, she shows, became a shield from an early age to “fight off all the other stuff,” including the guns, LSD, mental wards, hippies, and gangsters that pepper her pages. What MacGibbon remembers—and doesn’t—may lead to flinching. She’s comfortable with her material and spares no one, even herself, from a gimlet-eyed inventory. The subject matter in itself is daunting, even frightening, but MacGibbon, like the best magician, assures her audience that there’s nothing up her sleeve. Her courage and comedy make Fierce, Funny, and Female a winner.